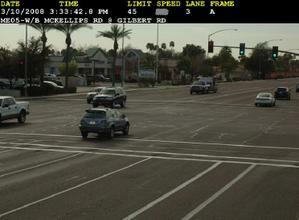 Beware of Red Light Camera at Gilbert & McKellips in Mesa! A couple years ago when I had to go to driving school, I was told the cameras in intersections can catch you either speeding or running a red light. 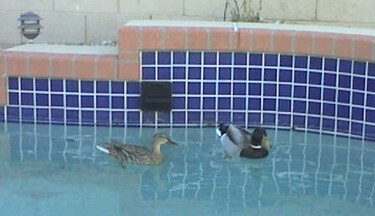 Some are set for red-light only while others are set for speed. But the cameras are all the same, it just depends on how they're programmed. I live just a few miles east of this intersection and drive through it quite frequently since it's between my house and my office. For those readers who are lucky enough to have never seen a photo radar ticket, I've posted one of the pretty pictures the City of Mesa was nice enough to send me (with the speed removed to protect the innocent, of course!). They say you have to be going at least 11 MPH over the speed limit to get your picture taken for a speed violation. Considering the fees they're charging for speeding tickets these days, I don't know how the City of Mesa is losing money on the photo radar program. Perhaps this recent re-programming of cameras is an attempt to get a better return on Mesa's investment. Obviously, I have mixed feelings about that! As a Mesa resident and taxpayer, of course I want the city to keep the roads safe, and I want them to maximize the return on investment when they spend taxpayers money...but not at my expense! If you're wondering where other Mesa traffic cameras are located, the City of Mesa's website lists all the intersections with red light cameras, along with the locations of Mesa's photo radar vans. Also, here's some more info on Arizona photo radar tickets. For every 1% increase in a neighborhood's foreclosures, violent crime increases 2.33%. It seems like the FHA Loan program is being looked to by government leaders, consumers, lenders and anyone in between to save the housing market. As a result there has been a lot of changes to this program within the past few months. 2. Down payment Assistance Programs: While this is not a direct FHA feature, one of the major reasons to use the FHA program is because it allows third-parties to contribute towards a buyer’s down payment. The FHA loan limit is 97% of the value of the property but it allows the remaining 3% to be gifted from such non-profits as AmeriDream, Nehemiah etc. Recently HUD (which oversees FHA) challenged the legality of such gifts and threatened to shut them down. The down-payment programs fought back and recently won in court. There are further changes coming to the FHA program. Congress is working on a FHA Modernization bill which will decrease the down payment requirement but add risk based insurance (higher insurance for lower credit scores). So, stay tuned, nothing stays the same in today’s mortgage market.